US Same Fate as Rome? Ancient Roads. Rome is at the center of the radial network of roads that roughly follow the lines of the ancient Roman roads which began at the Capitoline Hill and connected Rome with its empire. These ancient roads were built by the Roman soldiers and allowed Roman legions to be rapidly deployed and encouraged easy trade amongst the peoples of the empire. The Roman government even maintained periodic stations along the routes to provide refreshment to travelers, mile markers and horse relays for couriers that allowed them to cover 500 miles in 24 hrs. The concrete, masonry skills and will to build created a massive highway system which allowed troop movement and trade and solidified Rome’s position in the world. It is also where the saying "All roads lead to Rome” originates. 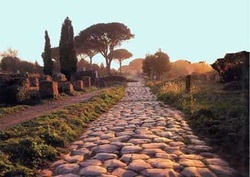 The Roman Empire built over 50,000 miles of roads during its reign. Read more about Roman Roads on HistoryLink101 web site. attempts were made to deal with the problem, including the banning of traffic in certain parts of the city.